National Geographic Children's Books, 9781426328671, 96pp. Space and the ocean. If you don't think they go together, think again! Both deep-sea and space explorers have to worry about pressure, temperature, climate, and most importantly, how to survive in a remote and hostile environment. Join us on an amazing journey as we go up in space with astronauts and dive deep down in the ocean with aquanauts to explore the far-off places of our planet and the solar system. With a strong tie into STEM topics--such as making connections, making comparisons, and recognizing patterns across content areas--readers will discover the amazing science and incredible innovations that allow humans (and sometimes only machines) to survive in these harsh environments. JENNIFER SWANSON is an award-winning author of more than 20 nonfiction and fiction books for children. She has received awards from Booklist's Top 10 Books for Youth Nonfiction, the Pennsylvania TriState Young Adult Review Committee, the Moms Choice Awards, and the Dove Foundation. Top reviews include a starred review in Booklist and recommended reviews from School Librarians Workshop, Library Media Connection, and the National Science Teacher Association. 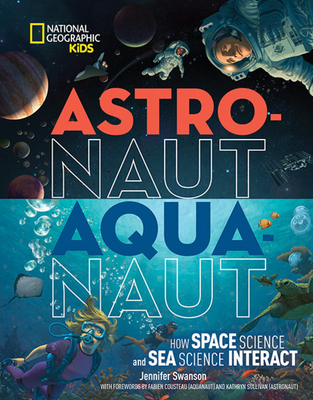 Other Nat Geo Kids titles include Brain Games, Everything Robotics, and Dr. E's Super Stellar Solar System. ANTONIO CAPARO is an illustrator, graphic designer, and comic artist whose fantastical work has been published on children's books and novels as well as in magazines. He has illustrated books for Hyperion Books, Harper Collins, Simon & Scheuster, Penguin Random House, and others.